where you use Visual Studio C# language. We make the controller with high-efficiency and high-calculation-performance embedding real time OS into industrial PC. You can use it as an EtherCAT Master Controller since it has correspond to EtherCAT®. You can also use HMI and file operatnion since Windows OS can run at the same time. You can achieve cost-saving and space-saving using this RT-C Language Controller! RT-C Language Controller has the following features. real time control. You can achieve up to100μs device control. 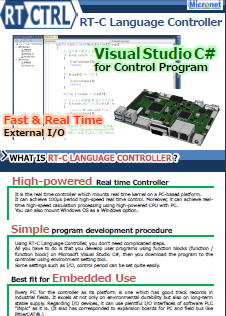 You use Visual Studio C# when you develop you programs on RT-C Language Controller. You can create your programs quite easily since it uses Visual Studio which is the most popular integrated development environment all over the world. You download your programs to RT-C Language Controller through an environment setting tool "MULTIPROG". "MULTIPROG" can set control period etc. of your programs as programless. It is also suited outside Japan since it has corresponded to multi language such as English, French, Germany, Japanese, Chinese. 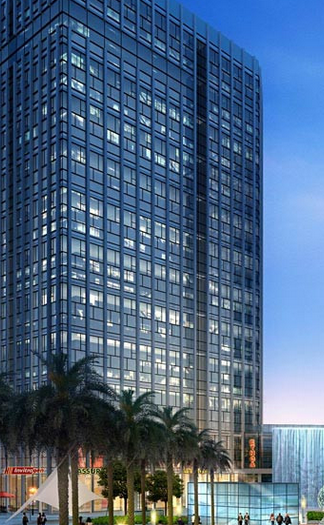 It correspond to various kinds of I/O device interfaces to achieve real time device control. You can use plentiful I/O Interfaces since it can use I/O drivers in common with SoftPLC product "INplc". Moreover, not only expansion interface boards for PC but also EtherCAT Master function are available. You can use USB, Serial Port, and also can use Ethernet communication via LAN port without any expanded hardware. ●Here we list a catalog which shows what RT-C Language Controller is. Please refer to it!